Parkscope: How Is Theme Park Labor Market Formed? How Park Get People? So back to theme parks: What's relevant about supply curves and theme park employment? Well, for one, "labor" is a market. There is unused and underutilized labor (unemployed), people demand a specific wage value in exchange for serving as labor, and based on the value of that labor, the quantity of people willing to do the labor will increase or decrease summarily. Back during the height of the Bakken Formation Fracking boom in North Dakota, there was a rush to build apartments and staff services to be used by high paid oil workers. Hiring generally started at the $11/hour level circa 2014, with many people making significantly above that for service level positions. This drove people to move to the region for low-talent, high wage jobs, and continued to boost the economic growth. Alternately, the $15 minimum wage increase in Seattle was cited in a NBER working paper as having lowered average employee wages in the immediate aftermath due to jobs being moved or cut. Clearly wage levels affect both an employers ability or desire to hire, while also being relevant to employees looking for jobs. Nobody really argues these things. Well, actually, they do when it comes to theme park employment. And strangely, it comes at a time when labor is increasingly dissatisfied with pay and under-staffing is endemic at regional operators. The argument from the traditionalists on the matter is simple: Theme park jobs are for high school and college age kids to make a low wage and have some fun between time in the classroom. They should be marketed as such and paid accordingly. But if park after park can't keep the food booths open for more than 2/3rds of its season, it doesn't seem like that's working. Youth labor isn't inelastic when it comes to working at theme parks. No labor is. 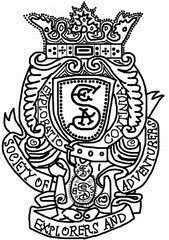 The devil, of course, is in the details. Let's begin with the basics: National unemployment rates. 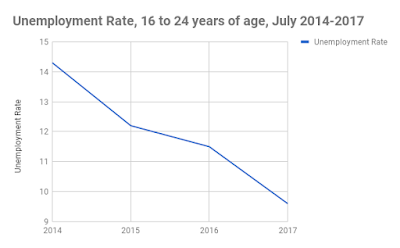 So the unemployment rate in the US is at 4.1% nationally. 4% is considered by most economists to be "full employment." That's right. Full employment. "But wait," you shout, "I've heard people say that the unemployment rate is fake! There's actually other metrics to use to determine unemployment that are better!" You're right - so what about the "real unemployment rate"? 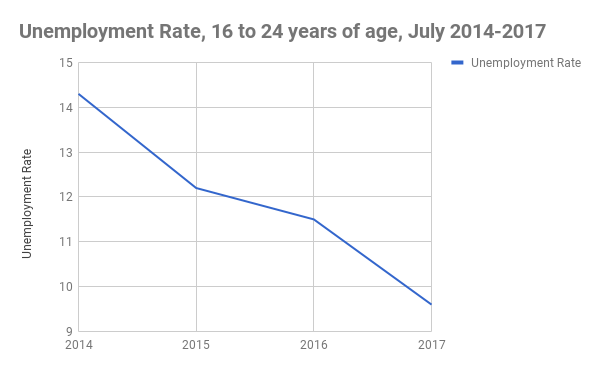 The U6 unemployment rate (what you really should look at) reached a 30 year low of 6.9% in 2000, then skyrocketed to 17.1% in the peak of the Great Recession circa 2009. It has dipped a full percentage point from 2016 to 8.1% in December 2017. That's right - it's approaching 30 year lows again. In short - no matter how you slice it, more people as a percentage of the potential workforce are employed than at any point in the last 10 years. Oh. Well, that totally doesn't let them off the hook. See, a percentage drop in unemployment is OK if the population has gotten larger. There's 100 million more people than in 1980, right? Well, the population is also aging in the US because of lower birth rates and the sheer weight of baby boomers. The unemployment rate matters, but so does the Labor Force Participation rate, because not everyone is willing or capable to work. That's right, we're right back to the same level as in 1977. While the labor force will continue to increase because more people are in America, it is actually projected to actually decrease as a percentage of the population to at least 61.6% in 2022. I say "at least" because that assumes similar levels of immigration. And maybe you've chosen to live in a cave, but the United States elected someone who is not pro-immigration and open borders. It elected someone who desires to build a wall on the southern border and is pursuing shipping out millions of both legal and illegal immigrants. Further: Congress and the Administration have worked to end the H2-B visa exemption that allowed seasonal non-farm workers to return to the US to work without counting against the hard 66,000 cap. This decision affected the ability of everyone from carnival operators to hotels to, yes, theme parks to be able to staff in 2017, and will again continue to wreak havoc in 2018. And kids? 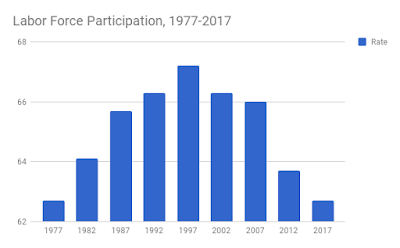 Turns out that the 16-24 demographic have gone from 72.4% 3rd Quarter labor force participation in 1987 to 57.8% Q3 2017. That drop is even greater in the traditionally lower averages for employment of students (57.8% to 39.7%). The number of kids who have been rated as not wanting to participate in the labor market has almost doubled since 1997. 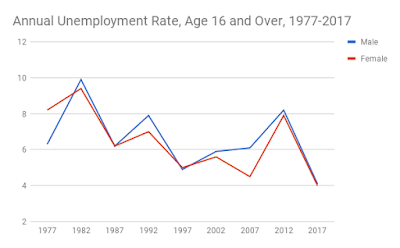 And since the labor statistics are really awesome to break down, we can see that while both 16-19 and 20-24 year old age groups have seen increases in non-participation, it's actually the 20-24 year olds that are choosing to not work at a greater rate than teenagers since 1977. So as a percentage of the population, fewer people today are working than at any point in the last 40 years and that number will continue to fall, while fewer people are being allowed to enter the US for work. The supply is dropping. But what about the demand? Well, the demand is greater too - nearly 20% greater in 2017 than in 2011. 400,000 more people are employed now in the recreation and amusement industries, and that doesn't even cover the unfilled positions. The Bureau of Labor Statistics is projecting a further 9.3% increase in demand for labor in the "Amusement and recreation attendants" category, requiring an additional 27,000 people to work in it. And that's just ride ops, folks - not the cashiers, not the food servers, not the fry cooks, not the warehousing guys charting the plush animals. So we have significantly greater demand and fewer available workers: according to the demand curve, that means that wages have to increase, right? 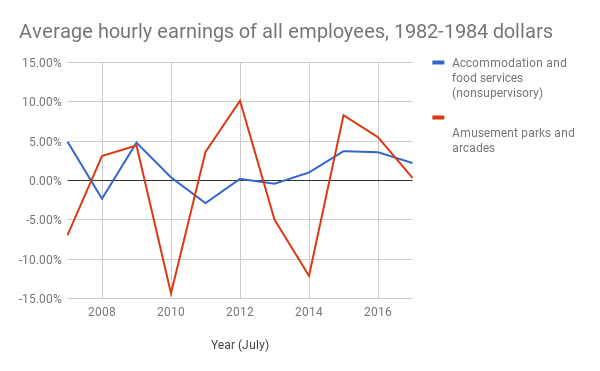 When looked at cumulatively, the results are obvious: between 2006 and 2017, accommodation and food services (the lowest end of the labor spectrum) paid its employees 14.6% more in real money on average, while amusement parks and arcades increased their pay by only 0.33%. What does this mean in terms of where amusement parks stack up for pay? In case you didn't know: of the positions tracked by the Bureau of Labor Statistics, Fast Food service and Amusement Attendants are the lowest paid. The. Lowest. Paid. But look closer and you'll start to see an issue: Don't kids spend the summer mowing lawns too? Well, those that do have a median wage that's about 25% higher than the ones running a coaster. 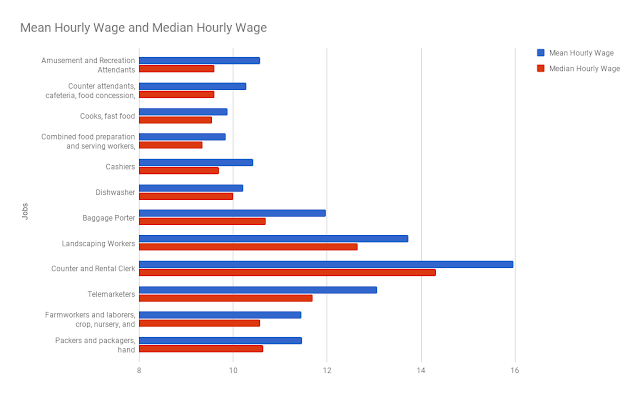 Farm work pays $2 a hour more on average in the US, and that's even with considering how it is typically done in the lowest of low income states versus where theme parks are located. These other low skill jobs have also had significantly higher real wage growth when put under the microscope; Landscaping employees have seen a wage growth of nearly 9%: that's 27 times higher than amusement parks. The evidence at the national level is clear: wage growth has been stagnant compared to competition for the same labor. The available labor pool as a percentage of the population is shrinking as new positions will be required. 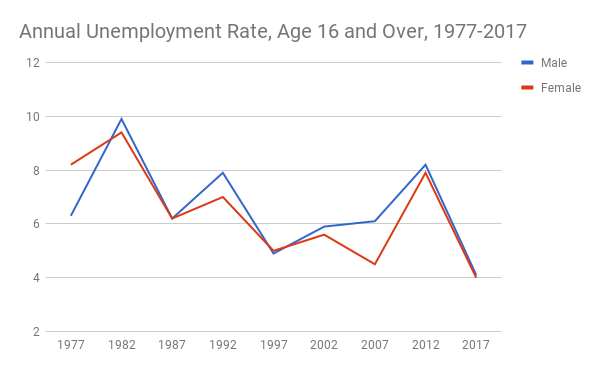 The traditional core laborers for the amusement sector - 16-24 year olds - are choosing to either not participate in the job market or, if they are, have found employment at a higher rate now than at any point in the last decade. Its tough to employ someone a second time when you want 60+ hours a week. 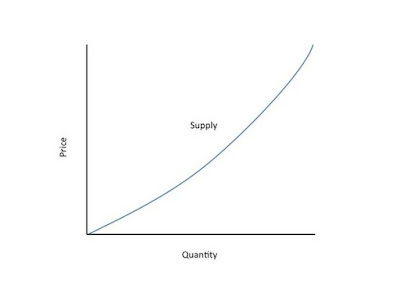 Remember the supply curve I already showed at the top? Well, according to that, if one wants to acquire a larger quantity of labor, what does one need to do? This is a lot of information to take in, but it is good to consider some of the criticisms and limitations here. First off, we're looking at this from a national perspective. Depending on the locality, unemployment rates and participation rates could be significantly higher. Cedar Point is especially susceptible among parks to national trends because they are located outside a major metropolitan area and have a seasonal operation. Orlando is to a lesser degree because they can run year round, but they alternately have issues with housing prices that Sandusky doesn't have. Ditto twice over for Anaheim, the San Francisco Bay Area, and San Diego for those high housing prices. Most other regional parks that don't necessarily have out of state employees that they're dependent on are still affected by the visa changes, however, and they too are going to be needing to compete even harder. Second, and it's the first one that most people are going to come back with: increasing labor costs will mean increasing the cost of the product! Well, products aren't priced based on the cost of the labor. Products are priced as it relates to the demands of the consumer. I mean, you did see the chart at the very beginning, right? Yes, of course, at a fundamental level any business that has more in expenses than revenue isn't sustainable, but there's a long, long way to go before proving that increasing expenses doesn't also increase revenue. Guests can't buy a locker if they're out of order. They can't play a game if the booth isn't manned. If a guest wants a drink and the stand is closed, that's a sale that's lost. Guests who find half the rides closed or lines that are preposterously long due to short handed crews leave the park and spend money elsewhere. If you don't have someone to cook the hot dog and someone to run the register, you can't sell it. When you sell hot dogs and beverages at a markup of 1500%, it might be in your best interests to spend an extra $5 an hour in staff to make that happen. You'd pay for it in 10 minutes. Isn't that weird too that demand in a closed market like theme park concessions is OK to talk about, but not when it comes to hiring labor? Finally, the last and best criticism - so, how do you go about recruiting people even if you do pay them more? Especially at seasonal parks? Well, look, there's a lot of ways to do it. Dollywood, Silver Dollar City, and Adventureland outside Des Moines, Iowa all cater heavily to senior citizens to work at their parks. Now, if you're an Central Florida park goer, you've seen AARP members running rides your whole life and never thought twice about it. The regional operators like Cedar Fair and Six Flags have tended to recruit kids that they feel can work outdoors in the heat with minimal shade or comfort and be ground into dust over 70-80 hours. That doesn't appeal very much to folks who are done working full time and just want to do something for 19.5 hours. Cedar Point this year seems to be making in-roads with the locals to offer shorter shifts built around people's schedules. From my personal experience: I worked at Lake Compounce in Bristol, CT eons ago, they had already done that and wound up with really good returning cast members. Turned out that grand parents are a lot better than 19 year olds when it comes to running the Hampton Motorcycles; who could have guessed at such a thing, right? Compounce did so well at retaining or recruiting locally that they stopped bringing in international employees in the mid 2000s. Sandusky has a pretty great location near the Lake Erie shore, and Cedar Fair owns literally thousands of acres of land off the peninsula to expand on. Why not do what Adventureland did and expand RV slots for seniors looking to have a good time each summer? You could do this in the Dells, Muskegon, Myrtle Beach, Wildwood, Coeur D'Alene, I mean, heck, it would probably work in Charlotte or Jackson too as long as you give everyone a pond to fish in and a free shuttle to a outlet mall somewhere once in awhile. Seasonal parks also need to work with local businesses to ensure that people who have jobs with them get a job somewhere else when the park is closed. Build or repairing those relationships is key. It's actually kinda stupid not to do it. You might have some NIMBYs out there, but business people are looking to make money, and they want to get good workers to help them do that. You help them, they'll help you. No park is too big to work with their community. In fact, if you really want to work with local businesses, let them run some of your excess inventory as concessions and take a cut. If you're already paying franchise fees (and most of them do), you might as well let the staffing be someone else's headache.